One more attempt has been taken by Padhagahara, a collective of volunteers in Sonepur, the district headquarter of Subarnapur to make the historical temple town polythene free. 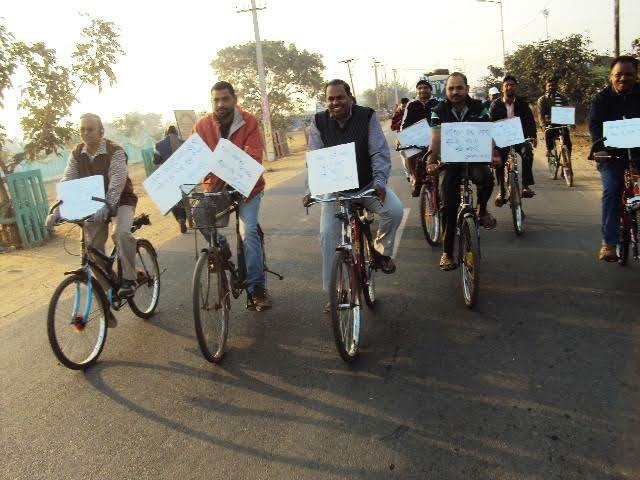 A cycle yatra was organised by this organisation on 13th January. Sharing the objectives Udit Baboo one of the volunteer told that Sonepur is witnessing high temperature in last few years. Polythene being hazardous to health is also polluting the environment hence impacting on climate change. Padhaghara is taking attempts to create awareness among the citizen to reduce the use of polythene. One of the active members Rajib Nayak told that the Municipality is duty bound to obey the plastic handling rules which does not allow use of polythene below 40 mili micron. However municipally is not taking any efforts to catch hold all those shopkeepers stocking this polythene. This is an attempt to build pressure on the administration to think on their take. Inaugurating the yatra Sri Dasarathy Satpathy, Collector and District Magistrate said that soon a squad will be constitute to specially look after making Sonepur polythene free. The squad will take into task to those who are stocking polythene not permissible as per the legal provision. Participating in the cycle yatra others administrative officials, academicians, teachers, senior citizens and media persons also appeal to reduce the use of polythene to make the town clean and green. A team of twenty five cyclists move around the town spreading awareness on cycling, impact of climate change and reducing use of polythene. Among other Laxmana Bhoi – District Education Officer, Dr Tapaswini Guru – Executive Officer of Sonepur Municipality, Deba Kishor Dani, President of District non gazetted employees association, Ambuja Bihari Satapathy, Dologovinda Panda, Byomkesh Mishra, Satyanarayan Sahoo, Sarada Prasanna Mishra, Bhagabat Panda, Gopesh Panda, Dinesh Ranjan Mishra participated.